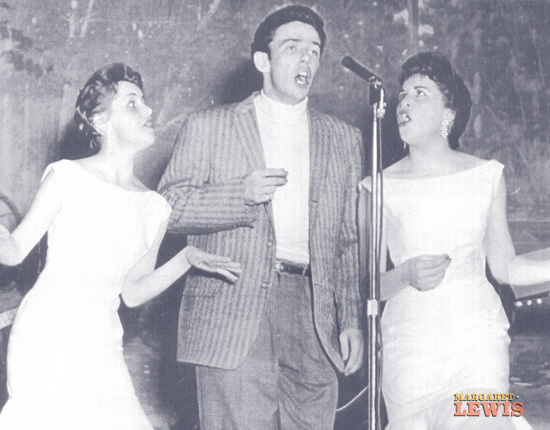 Above: The Lewis Sisters- Rose, left, and Margaret, right, with Dale Hawkins on stage at the Louisiana Hayride. Two of Dale Hawkins Checker sides where the Lewis Sisters are on backup vocals are today’s song of the day -the dreamy La-Do-Dada and the R&B drenched Ain’t that Loving You Babe. Margaret Lewis will recount her time with Dale Hawkins with music writer Michael Hurtt this Tuesday July 17th, 2012 at 6 p.m. at the Old US Mint in New Orleans at the Heroes of Louisiana Music series at the Mint.